Secondary Inscription: Inscribed front pastedown, upper left corner, in ink, "Lot 161"; in another hand, in pencil, "CW/", "32" (encircled), "No. 7" (encircled). Inscribed first flyleaf, recto, at top of page in center, in pencil, "Steinveld Missal or Sacramentary / Older part about 1200 / later -- 1440"; in center of the page, in the same (?) hand, "£84". Inscribed fol. 1, fifteenth-century shelfmark of Steinfeld Abbey written in the upper left corner, in ink, "A9". Inscribed fol. 5, fifteenth-century owner's inscription, upper margin, in ink, "Liber eccl[es]ie s[an]c[t]e Marie s[an]c[t]iq[que] Potentini i[n] Steynwelt". Inscribed fol 47, "Collect for the Feast of Saints Potentinus, Felicius and Simplicus, whose relics had been housed at Steinfeld Abbey since 920: Propiciare nobis quaesumus domine damulis tuis per sanctorum martirum tuorum Potentini, Felicis, Simplici ... qui in praesenti requiescunt ecclesia ...". Inscribed fol. 67v, written in gold on blue and red-brown borders surrounding the Crucifixion, "Cesus Abel ruit. et roseus / fluit in nece sanquis. / Eneus in cruce. vulnere / pro truce tenditur anhuis / Sensus in his latet. at prope iam patet ipsa figura / fata Ihesus subit. exul homo redit ad sua iura / Aspice mens pia. que bona sit via. qua gradiaris / tollitur in cruce Chistus, eo duce recta sequaris." In the inscription on fol. 47, "Martirum" was substituted, probably for confessor, in the fifteenth century. This Romanesque missal was written and illuminated for the Premonstratensian abbey of Saint Mary and Potentius at Steinfeld, near Cologne. This type of manuscript was used by the priest to say the mass. 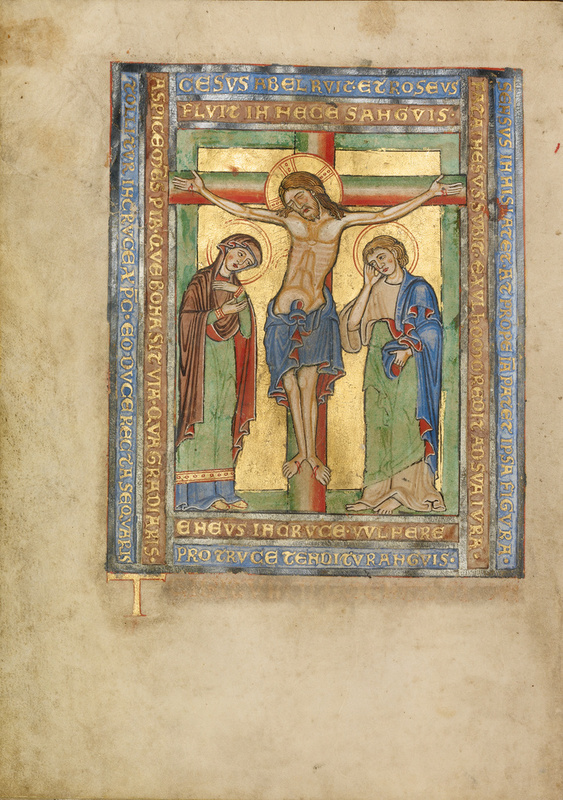 Most illuminated missals, like this one, include a full-page image of the Crucifixion, which marks the beginning of the canon of the Mass, the prayers said by the priest as bread and wine are ritually transformed into the body and blood of Christ. This celebration commemorates his Crucifixion and the salvation it provided humankind. This manuscript also displays large, gold initials filled with curling vines and hybrid animals that mark the texts used by the priest on major feast days during the Christian liturgical year. The book also includes mass chants accompanied by an early form of musical notation, known as neumes, written on a four-line staff with each line executed in a different color to indicate various pitches. 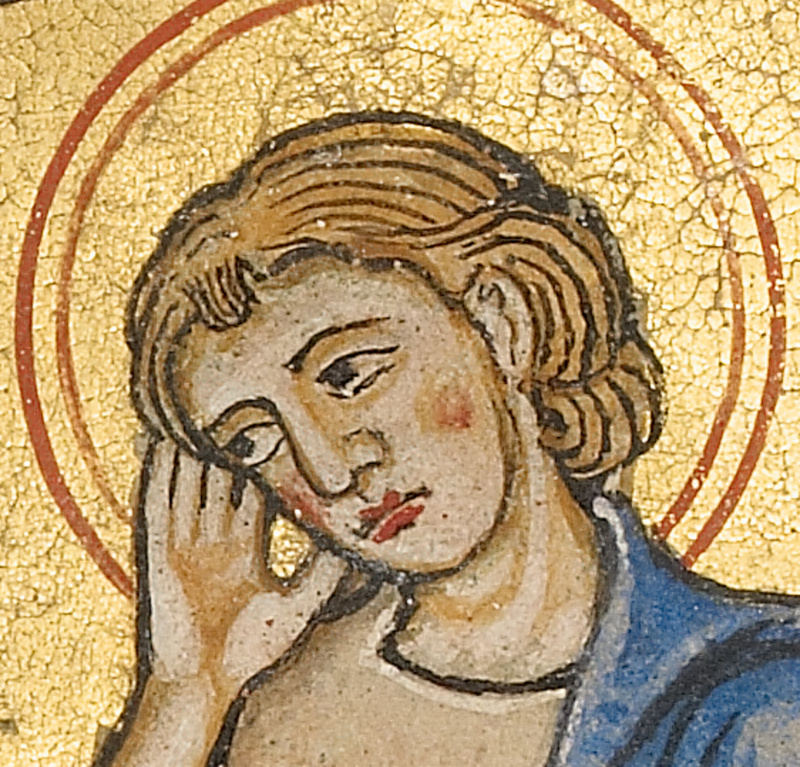 Exhibition of Illuminated Manuscripts, exh. cat. (London: The Burlington Fine Arts Club, 1908), 37-38, no. 76. Warner, George. Descriptive Catalogue of Illuminated Manuscripts in the Library of C. W. Dyson Perrins. 2 vols. (Oxford: Oxford University Press, 1920), vol. 1, pp. 287-88, under no. 121, pl. CX. Swarzenski, Hanns. Vorgotische Miniaturen: Die ersten Jahrhunderte deutscher Malerei. 2nd ed. (Königstein im Tanaus and Leipzig: Karl Robert Langewiesche, 1931), p. 95 (entry for pl. 74). Swarzenski, Hanns. Die lateinischen illuminierten Handschriften des XIII. Jahrhunderts in den Ländern an Rhein, Main und Donau (Berlin: Deutscher Verein für Kunstwissenschaft, 1936), pp. 14-15. Sotheby's, London. The Dyson Perrins Collection, Part II: Catalogue of Forty-Six Western and Oriental Illuminated Manuscripts. December 1, 1959. Grosse Kunst des Mittelalters aus Privatbesitz, exh. cat. (Cologne: Schnütgen Museum, 1960), cat. no. 107. Bloch, Peter. "Das Steinfeld Missale." Aachener Kunstblätter 22 (1961), pp. 37-60. Grimme, Ernst Günther. "Grosse Kunst aus Tausend Jahren: Kirchenschätze aus dem Bistum Aachen." Aachener Kunstblätter 36 (1968), pp. 1-335, p.52, no.95. Plotzek, Joachim M. "Zur rheinischen Buchmalerei im 12. Jahrhundert." Rhein und Maas 2 (Cologne, 1973), pp. 318-320. Euw, Anton von, and Joachim M. Plotzek. Die Handschriften der Sammlung Ludwig. 4 vols. (Cologne: Schnütgen-Museum, 1979-1985), vol. 1 (1979), pp. 234-39. Lammers, Joseph, ed. Köln, Westfalen 1180-1980: Landesgeschichte zwischen Rhein und Weser, exh. cat. (Cologne: Kölnisches Stadtmuseum, 1980-1981), pp. 402-7. Legner, Anton. Deutsche Kunst der Romanik (Munich: Hirmer Verlag, 1982), no. 478. "Manuscript Acquisitions: The Ludwig Collection." The J. Paul Getty Museum Journal 12, 1984, p. 288. Kren, Thomas. Illuminated Manuscripts of Germany and Central Europe in the J. Paul Getty Museum (Los Angeles: J. Paul Getty Museum, 2009), pp. 31-33, 65-66.